Today Tom and I volunteered as Gate Keepers for the Silver Ski Race, held annually at Badger Pass. 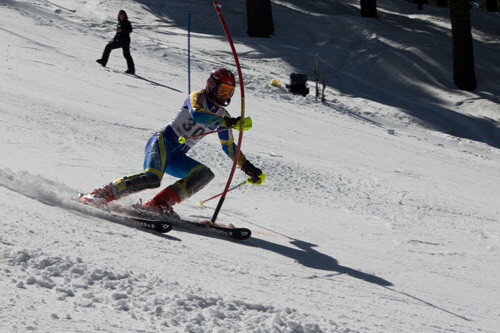 Although I haven’t been around ski racing much, Tom has, and being a spectator at the Eastern Championships was a bunch of fun, so when the Head Coach of Yosemite Ski Team asked if I could help out, I said yes. There are a lot of moving parts when it comes to organizing a race like this, and it was interesting to see. There are skiers, coaches, crowds of excited parents, timers, gate keepers, course maintenance folks, and who knows what else. The course was set with knee-high gates for the younger kids, and then they changed out to the full-height rapid gates for the older skiers. From the perspective of a Gate Keeper, all of the sudden a dozen people with bags and tools descend from the starting area, and start replacing gates. There isn’t much discussion, as everyone seems to know what they are doing, and then, voila, the gates are in place. 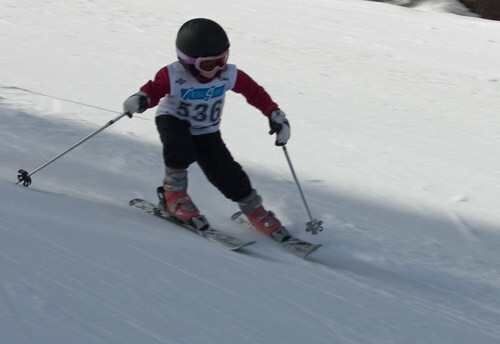 There was a wide range of skiers in the race, from the cutest little kids with bunny or unicorn helmet covers, to quick-footed teens who come through fast, slapping the rapid gates to the snow. We took a bunch of pictures, but it is hard to tell who is who with the helmets, goggles, and sleek-looking racing suits. Skiing the gates looks like so much fun, it’s too bad that there isn’t a Masters Racing program nearby. The mental and physical challenge of running a course as fast as possible is really exciting. I guess there is NASTAR, which at Badger is set up both weekend days in the afternoon, and is wicked fun in it’s own right, but a slalom course with rapid gates is a different kind of challenge. Of course, the last thing I really need right now is yet another hobby.